Rokumeikan (鹿鳴館) in Hibiya, Tokyo. Commissioned by Foreign Minister Kaoru Inoue (井上馨 , 1836-1915) and designed by British architect Josiah Conder (ジョサイア・コンドル, 1852-1920), the Rokumeikan was completed in 1883 (Meiji 16). The building’s aim was to help introduce Western customs, and to function as accommodation for government guests. 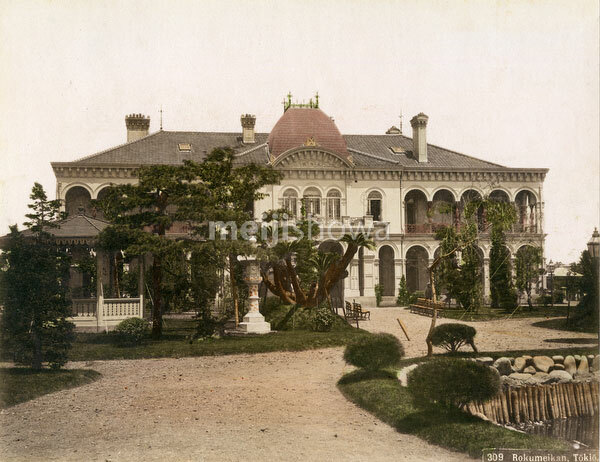 The Rokumeikan lost its need when the Imperial Hotel was opened in 1890 (Meiji 23). It was demolished in 1941 (Showa 16).